FILE - A combination of two photos shows U.S. President Donald Trump and Russian President Vladimir Putin as they arrive for the G-20 summit in Hamburg, Germany, July 7, 2017. The White House has declined to release any details of a G-20 summit dinner conversation earlier this month between President Donald Trump and Russian President Vladimir Putin. "This was a social dinner and that was the nature of the evening," White House spokesperson Sarah Huckabee Sanders told reporters who pressed her on Wednesday about the topics the two leaders discussed. 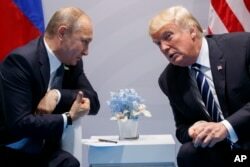 Looking back at news coverage of the Trump-Putin meeting a day earlier, when the encounter first became known in the United States, Sanders said it was "a little bit ridiculous" to describe the two presidents' chat as a private conversation, when more than two dozen other national leaders and interpreters were sitting nearby and in plain view during a formal dinner in a large dining room. However, many former diplomats, political commentators and Democratic lawmakers repeated the same phrase Wednesday when asked about the second extended Trump-Putin conversation: "It's not normal." The top Democrat on the House Intelligence Committee, Adam Schiff, said he was astonished to learn of the meeting and found it "deeply troubling." "Guess this is what Trump calls Прозрачность [transparency]," Schiff wrote on Twitter. The president should, either through Twitter or his press secretary, "immediately read out the content of his one-on-one chat with Putin before Putin does," said a former U.S. ambassador to Russia, Michael McFaul. Trump's tweets and White House officials strongly rejected assertions that the second Putin-Trump conversation was kept under wraps, just hours after two presidents' first face-to-face conversation in Hamburg on July 7 — a meeting of more than two hours, with the U.S. secretary of state and the Russian foreign minister present, along with a translator for each side. FILE - U.S. President Donald Trump meets with Russian President Vladimir Putin at the G-20 summit, July 7, 2017, in Hamburg. Trump and Putin met for more than two hours in their initial face-to-face conversation. Officials traveling with Trump at the time had not mentioned the dinnertime conversation, but they said on Wednesday that the dinner was well publicized. 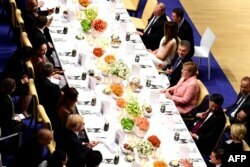 Reporters and photographers were not allowed to be present during the dinner, however, and there was no detailed "readout" from White House officials about Trump's contacts with other heads of state, as well as Putin. "To act as if this was some secret is absolutely absurd," Sanders said at an off-camera White House briefing. Trump took to Twitter quickly to repudiate the stories that flashed across U.S. news media Tuesday evening: "Fake News story of secret dinner with Putin is 'sick.'" At issue, however, is how long the two conversed after Trump moved away from his designated seat at the dinner, near Japanese Prime Minister Shinzo Abe. The White House initially described the second Trump-Putin discussion as "brief." "We weren't following him around with a stopwatch," said Sanders on Wednesday when pressed for a more precise length. "But it certainly wasn't an hour," as it was described in many media reports based on anonymous accounts from other leaders at the dinner. Trump told the New York Times Wednesday that he and Putin talked for about 15 minutes, "pleasantries more than anything else." "I actually talked about Russian adoption with him," Trump said. The Russian leader banned adoptions of Russian children by Americans five years ago, after the United States enacted sanctions on Russians accused of human-rights abuses. Trump also was criticized for having such an extended discussion with the Kremlin leader without any other Americans present. Images from the dinner show Putin and Trump seated side by side, with a Russian interpreter leaning over between them. Other dinner guests were seated near the two presidents, but the spacious table setting made it possible to keep the conversation private. FILE - German Chancellor Angela Merkel, center right, flanked by, from left, Russia's President Vladimir Putin, U.S. first lady Melania Trump, Argentinia's President Mauricio Macri and China's President Xi Jinping, attends a banquet after a concert at the Elbphilharmonie concert hall during the G-20 summit in Hamburg, Germany, July 7, 2017. The furor over the Trump-Putin dinner chat is the latest chapter in an ongoing controversy involving the U.S. president and Russia. Last week's domestic news was dominated by reports of a meeting in June 2016 between Donald Trump Jr., the president's eldest son, and a group of Russians including a Kremlin-linked lawyer, a former Soviet spy and an interpreter previously investigated for money laundering. Trump Jr. had tried to minimize that session in New York as a routine, brief and uneventful meeting, but piecemeal disclosures of what happened and who took part forced him to switch his story several times. The president has continued to deny any collusion with Russia and insists that the United States will benefit if he can build a friendship with the Russian leader. Ties between the Trump presidential campaign and Russia are the subject of an investigation by Special Counsel Robert Mueller. In addition, there are four congressional committees investigating Russian interference in the 2016 U.S. presidential election in which Trump won the electoral count, defeating Democrat Hillary Clinton, who captured the most votes.